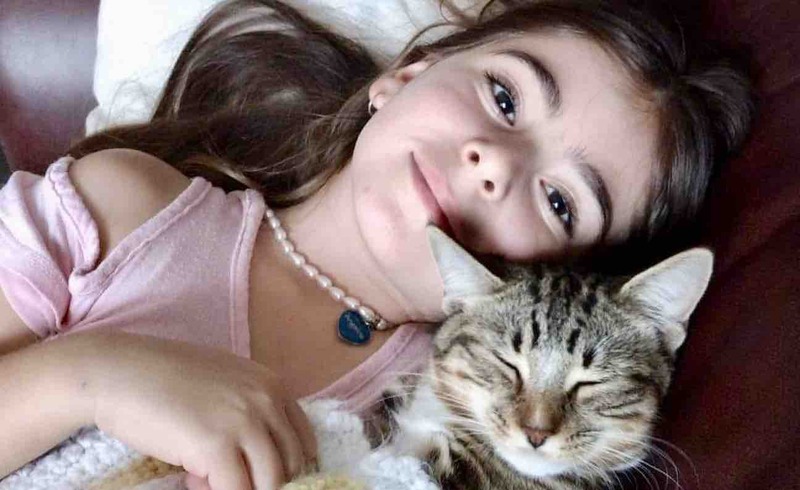 We were devastated to learn recently that my 7 year old niece Angelina was diagnosed with Lyme Disease, a spirochetal infection which is usually transmitted by a tick bite. Angelina's parents recently tested her for Lyme disease due to a sudden onset of unexplained seizures, choking episodes, dizziness and migratory joint pain and inflammation. Having suffered from Cyclic Vomiting Syndrome for several years, the strong positive lab result of a Lyme infection suggests that Angelina has had Lyme for several years but with more severe symptoms only emerging recently. Once a person is beyond the acute (beginning) phase of the infection, the dissemination of the illness can cause severe joint and muscle pain, arthritis, neurological symptoms, brain fog, chronic fatigue, seizures, carditis, vision problems, meningitis symptoms, neck pain, head pain, depression, anxiety, cognitive difficulties, learning difficulties, mood disturbances, breathing problems, swallowing problems, sound sensitivity, light sensitivity, gastrointestinal problems, night sweats, chronic inflammation and much more. Antibiotic treatment has a very limited ability to eradicate disseminated lyme disease. Sadly, Angelina's father has himself suffered from Lyme disease for several years and was treated with an IV antibiotic PICC line for several months in an effort to restore some of his health. However, coming off the antibiotics only made him relapse, and the long-term effects of continuous antibiotic use were very harsh and damaging to his body. Angelina just started 6 weeks of antibiotics and soon after that, we hope to treat both Angelina and her father with a new treatment technology by purchasing a machine made in the U.S. that has helped many Lyme sufferers achieve up to a 90% improvement in symptoms. Unfortunately, this treatment technology is not covered by Medicare as the Canadian medical system is very slow to advance in the prevention, diagnosis and treatment of Lyme, leading to terrible, long-term suffering. The funds raised will allow Angelina’s mother (my sister Randa) to purchase the machine that will provide the new treatment for Angelina and her dad, as well as supplemental treatments that will provide immune system support. The combination of the machine and treatments will cost $20,000 CAD. Angelina is such a vivacious, positive, talkative, little girl who loves to dance and learn martial arts. I pray that she will be spared from the more debilitating effects of Lyme disease. Please join us to help our adorable Angelina and her family in their challenging journey of healing. Thank you! Note 1: GoFundMe does not charge a fee for using their platform....a “voluntary tip” is suggested (as a %) but you can choose “other” in the drop down menu and put whatever amount you like. Note 2: If you prefer, you can choose to appear as Anonymous on the Campaign page at the time of your donation. Or you can request that I change your name to appear as Anonymous. You will still receive all our updates. Dear friends and family, this is a small update on Angelina's progress on the Ampcoil treatment. Angelina seems to be doing better as most of her symptoms have not resurfaced since she started to the treatment. Even though we have a long road ahead we strongly believe that this treatment will help her and her father on the path to recovery. Her father still has many symptoms but he is hopeful that over the next few months and even years that this technology will help to trigger some needed healing. We thank you all for your support and prayers and wish you all blessings of the season. Happy holidays! Delighted to let you know that the Ampcoil machine has arrived! 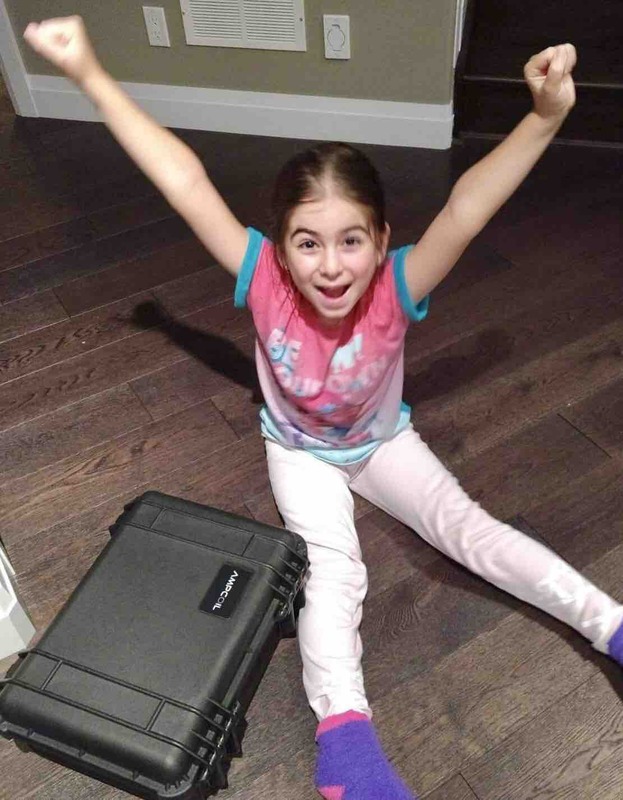 Here’s a photo of Angelina showing how excited she is to have received it! She and her dad have just started their treatments. We are praying that this portable, in-home pulsed electromagnetic field therapy (PEMF) with biofeedback along with other supplements will strengthen their immune systems, help fight the Lyme bacteria and significantly reduce their Lyme disease symptoms. Once again, thank you to all who have given their valued support! Please continue praying for ongoing healing and recovery! Our family thanks you all for your generosity and thoughtfulness. It is incredible to see how many people helped! Your support has truly restored my faith in humanity. Angelina's eyes were wide in amazement when the goal was reached and she is very grateful for your big hearts. Also, a special thank you to Rula, my sister, who organized the fundraiser, as well as my other sisters who also helped to get this going. Wow! We just surpassed $20,000! Thanks so much to all of you who contributed so generously and with such big hearts! 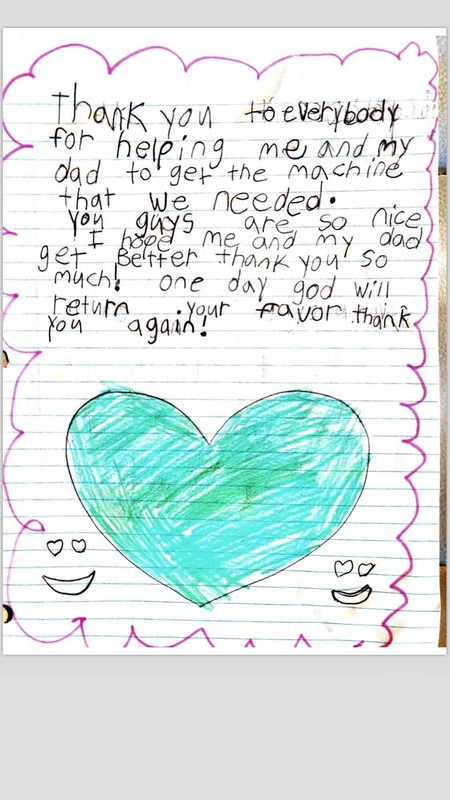 I’ve attached Angelina’s thank you note in which she sends you all a big heart too! Angelina is continuing on her antibiotic treatment. The machine to treat both her and her dad has been ordered and is due to arrive within weeks! We will keep updating you with pictures of the machine and progress reports once that treatment starts. One of our wonderful supporters Marian has organized a Thanksgiving get-together with friends and asked that in lieu of food or drinks being brought to the event, that her guests contribute to our campaign. We are so thankful for Marian and her friends’ efforts and will gratefully accept their support over Thanksgiving in the next week. The funds will be used for immune support therapies and supplements as Angelina continues her fight against Lyme disease. A big heartfelt thank you from Angelina!